It's Comic Con this weekend, so this is a great time to talk about comics for food lovers. First of all let's start with the fact that Anthony Bourdain food writer and television personality extraordinaire has released a graphic novel Get Jiro! G4 did a great interview with him about the book and how the project came into being. Of course Japan has a comic book for just about everything and as a food loving nation there are many options for great food oriented manga. Here are some of my favourites. Yakitate!! Japan follows Azuma Kazuma a sort of 'bread genius' who's intent on finding a bread suitable for the Japanese palette and making Japan as famous for bread as France or Germany. Azuma enters competitions looking to gain a job at the main branch of the Pantasia bread chain, a prestigious job with Iron Chef style battles. Along the way he makes some friends, invents amazing recipes and solves family problems for the Pantasia owners. Watch out for the recipe on how to make bread in a rice cooker. Oishinbo is probably my favourite comic of all time. It follows Tozai Shimbun a food writer for a Japanese newspaper searching for the Ultimate Meal. The comic focusses on different types and regions of food in Japan, each episode talks about how to find the most amazing ingredients for a dish, or how to improve a dish that doesn't hit the mark. It goes into huge depth on how to prepare foods including filetting fish, polishing rice and how best to store live animals prior to cooking. For the Japanese food lover this goes into extreme detail on regional specialties, seasonal foods and unusual delicacies in Japanese cuisine. My only sadness is that you can currently only buy 6 collected 'best of' books rather than the 120 or so books that were released in Japanese. There's also an anime TV series based on the manga. I cannot recommend this book enough. If you're thinking that the title of Iron Wok Jan invokes thoughts of Iron Chef you'd be right, though the Japanese title is Tetsunobe no Jan I assume the translaters were trying to carry on the Iron Chef obsession in America. The comic follows Akiyama Jan an arrogant young chef with an excellent command of the Chinese cuisine. He heads to Gonbanchou a family owned Chinese restaurant in Ginza to show off his skills. Rivalries and cooking competitions follow of course! 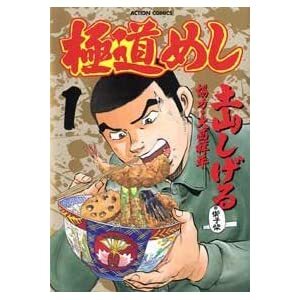 Gokudo Meshi is 'gangster food' a story of a group of gangsters and criminals put away in South Naniwa prison who are obsessed with food. Each year they battle it out for the prized parts of the new years meal by telling stories of the best food they ever ate. Like many great food manga sadly there is no English translation for sale in print however one can easily find copies on Scanlation sites, armed with an eBook reader this presents no problems for keeping up with your favourite food manga. Gokudo Meshi was turned into the live action Japanese movie Sukiyaki in 2011. Hungry for more? Check out Wikipedia's list of Cooking Anime and Manga for more. I'll recommend Project X: Nissin Cup Noodle. And it's a true story!